Sorry about the lack of recordings on Anglo-Saxon Aloud. There are a variety of reasons, none of them interesting. But I am now back on track and intend to keep posting the Paris Psalter until it is done. These postings will be in spoken (rather than sung) form. I'll begin at Psalm 69 and continue to the end, and then go back to the beginning (Psalm 50) and record those in spoken form also. I estimate, then, that the entire ASPR will be on the web by approximately the end of September. 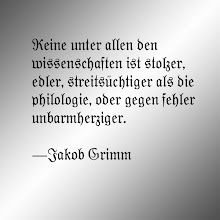 Then I guess we start in on the prose, beginning with the Sermo Lupi. My latest course from Recorded Books' Modern Scholars Series is my grammar book, which I recorded back in the spring. I'm very happy with the way it came out: the people at Recorded Books did a pretty amazing job both with the audio and with designing a nice course book. If you want to improve your grammar and laugh while you're doing it, you might enjoy this book. And you'll get to hear the whole "That's no panda, that's a $%$#%-ing racoon!" joke as well as my railing about the transcendent stupidity of the split infinitive convention. (Also, the red panda for the course mascot was chosen long before Kung Foo Panda came out, and my Red Panda is better--and a direct challenge to the black-and-white pandas of Lynne Truss and David Crystal). Lecture 2 What Is Grammar? Lecture 10 Subjects and Predicates and Objects, Oh, My! I'm not sure if I've ever had to work at such an unrelenting pace for so long. It definitely goes back to January, and I think actually it's been a whole year, since the middle of last June when I became department Chair. I have at points had the subsequent twenty-five days planned out to about the hour so I knew how much work I would have to do, and when I would get it done (I mostly kept those hellish schedules). But on July 4 I sent in the course book for the Modern Scholar course on poetry, Monday I sent in my review of Alaric Hall's Elves in Anglo-Saxon England (very short version: read this book! ), and today I sent in my SASLC entry on "Maxims, Aphorisms" (short version: there aren't any that aren't also, in more places, labeled something else, so we should delete the category and just stick with "proverbs"). 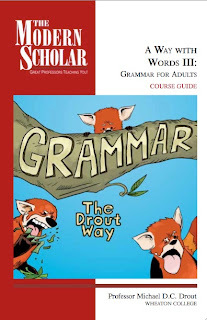 Today my gratis copies of the previous Modern Scholar Course (A Way with Words III: Understanding Grammar for Powerful Communication," or, as the cartoon on the cover says "Grammar the Drout Way") arrived at my door, and copies of Tolkien Studies volume 5 should be there soon. I still have stuff to do this summer: write the two papers that have come out of our computer analysis of Old English project; draft the first chapter of the new Tolkien book for my agent; get Anglo-Saxon Aloud finished; write and record the new Old English Poetry CD I'm doing (Modern English lectures to be interspersed with the poetry); design the Logic and Language course; organize the department files, which haven't been organized in years and years; get going on the Philology textbook and the column, with Scott Kleinman, on etymology. But, for the first time since last June, I am not behind in anything. Weird feeling. So I am going fishing. In Ker's Catalogue of Manuscripts Containing Anglo-Saxon, he mentions a "collection of metrical apothegms, moral and religious" (citing Kemble for this quote) in alliterative verse, arranged in about 20 paragraphs, in the manuscript Cambridge UL, Ii.1.33 (this is Ker's number 18 art. 44). These apothegms do not appear in volume V of the Anglo-Saxon Poetic Records, The Anglo-Saxon Minor Poems, as you might expect. They were edited, however, by James Rosier: 'Instructions for Christians,' Anglia 82 (1964): 4-22 ; 'Addenda to "Instructions for Christians",' Anglia 84 (1966): 74. The text is Dictionary of Old English Cameron number A44 (A44_Instr_T01950). So now if you need this text, which begins "Syle ece god æhta †inra..." you can find it and won't waste forty-five flipping back and forth through the ASPR muttering "I just don't know how I missed this," before thinking to run the opening line in the DOE corpus.